Your New Favorite Joint Health Supplement! If you’ve been suffering from joint problems caused by injuries, swelling or arthritis, and have tried just about everything to get relief, it can feel like you’ll never get back to the way things used to be when you were pain-free, flexible, and could physically do whatever you set your mind to. But now there’s a new way to maintain good joint health. 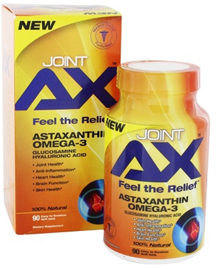 Introducing Joint AX, the all new joint health product that’s clinically formulated to deliver a combination of potent natural compounds that help fight the causes of joint problems and provide a wide range of additional benefits to help you get moving freely again. JOINT HEALTHANTI-INFLAMMATIONHEART HEALTHBRAIN FUNCTIONSKIN HEALTH These statements have not been evaluated by the Food and Drug Administration. This product is not intended to diagnose, treat, cure, or prevent any disease.